Visit Denali's Kantishna Roadhouse. 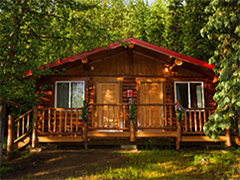 The native-owned, full service lodge is located deep in the heart of Alaska's majestic Denali National Park & Preserve at the end of the park road in Kantishna. We invite you to spend your days viewing Denali's abundant wildlife and breathtaking wilderness while relaxing in the evenings in our beautiful and unique lodge, with all the comforts of home. 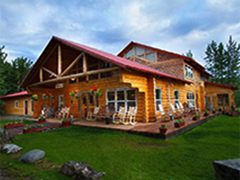 The lodge has a long-standing Alaskan tradition of hospitality, native heritage and history. The original Kantishna Roadhouse was built in the early 1900s, serving as a private residence, a community center, a post office, and informal accommodations for those who came visiting the Kantishna area. Through years of hard work, the roadhouse has evolved from a gold miner's tent camp into a modern Alaskan resort with a rustic flavor. The 32 full-service cabins were built in 1993 constructed of freshly stripped and shiny varnished Sitka spruce logs overlooking Moose Creek. The first building entering the property is a lovely, historic cabin built in 1906, complete with a sod roof garden of wildflowers growing on top. This was the official State recorder's log cabin where miners recorded their claims. The beautiful main lodge features the dining area, a new library resource room, a hand-crafted bar, and a spacious lobby. Arrive in Denali Village on your own. The transfer bus departs from the Rail Station at 2:00 pm - in timed to connect with the Alaska Railroad service from Fairbanks. Clients arriving from Anchorage may overnight near the park entrance. Denali National Park is renowned for its wildlife. During your 95-mile travel to and from the lodge you'll have fabulous opportunities to see most of the Park's wildlife up close. Bring your binoculars, and photographers be warned; you'd better have your favorite camera ready! You and your driver will be on the lookout for Denali's grizzly bears, moose, caribou, dall sheep, wolves, fox, coyote, and numerous other smaller animals and assorted species of birds. Arrive at the lodge, located at the end of the Park Road at 8:00 pm. After enjoying a delicious dinner take advantage of the long daylight hours to stroll around the area or participate in the evening programs about Alaska and its wildlife. Good aurora borealis viewing from September onwards. After a delicious morning breakfast enjoy the entire day in the National Park. We feature an abundance of unique opportunities for you to explore the wonders of Denali's wilderness. With the exception of guided horseback trail rides, all of the necessary equipment for activities is provided to our guests at no extra charge. Join us on popular daily backcountry walking excursions. These guided hikes - suitable for all ages - are ranging from two to six hours and are excellent opportunities to explore the Kantishna area and learn about the wildlife and flora of the Kantishna Hills from one of our experienced naturalist guides. If mountain biking is on the top of your favorite outdoor activity list take one of our mountain bikes and spend some time exploring the countryside. You may also bike down to Wonder Lake for a view of the "Great One" or investigate the old mining roads within the area. For those with a twinkle in their eye, slip on a pair of rubber boots, grab a gold-pan and head down for the creek. Learn about the history and methods of the old-time prospectors and try your hand at panning for a little "color". Any gold you find is yours to keep! Try your hand at fly-fishing for Arctic Grayling in nearby Moose Creek. Both fly and spinning rods are available. After a full day of activity enjoy a delicious dinner in the dining room. Participate in the evenings in our Denali interpretive programs and slide shows. We are the only lodge within Denali Park who has a concession for horseback riding and we offer hourly rides and full day trips. The private bus departs the Lodge at 6:45 am and arrives at the Denali National Park Entrance around 11:30 am to connect with the Alaska Railroad train service to Talkeetna and Anchorage. We invite you to take the ride on the wild side: Hop on board our private bus and experience 92 miles of breath-taking Alaskan beauty and adventure. Travel the entire length of the Park road with our knowledgeable guides/drivers as they share the biology, geology, and history of the region with you. Have your cameras ready to capture majestic Mt. McKinley and other pristine landscapes. 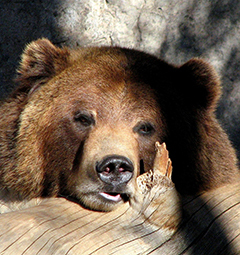 View bears, caribou, fox, moose, wolves, and birds in their natural habitat.